UFC women’s bantamweight champion Amanda Nunes is going to headline UFC 224, but it won’t be against featherweight titleholder Cris Cyborg as many had hoped. Though UFC president Dana White was angling for a Cyborg vs. Nunes match-up as the next fight for both women, timing didn’t work in his favor. With Cyborg having fought three times in the past seven months, most recently at last week’s UFC 222, asking her to return at UFC 224 on May 12 was a bridge too far. Though the UFC could have held off and made the bout for UFC 225 or UFC 226, they needed a suitable headliner for UFC 224 and Nunes had already agreed to fight Raquel Pennington on May 12, so it appears they are moving forward as originally planned. Nunes, fighting on her home turf in Brazil, will put her bantamweight belt on the line opposite Pennington in the headliner, but she’s not the only high profile Brazilian on the UFC 224 fight card. 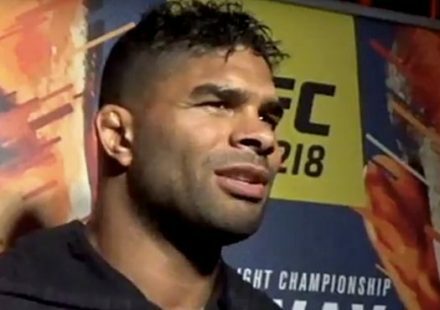 Fellow Brazilians and former UFC champions Vitor Belfort and Lyoto Machida are set to fight each other in what is expected to be the UFC 224 co-main event. It will also serve as Belfort’s retirement bout. Not far behind is another Brazilian, Ronaldo “Jacare” Souza, who will square off with Kelvin Gastelum in another marquee middleweight bout on the pay-per-view portion of the event. It’s been a long layoff for Nunes (15-4), who hasn’t fought since her split-decision victory over Valentina Shevchenko at UFC 215 last September. She has been angling for a superfight with Cyborg ever since defeating Shevchenko for the second time, but she’s going to have to wait a little longer and first get past Pennington. Nunes heads into the bout on a six-fight winning streak.